Whether or not you saw the movie “The Founder,” you’re probably already aware that McDonald’s had a lot of successful firsts, such as the first assembly-line system for fast food. You may not know that in 1958, McDonald’s was the first fast food restaurant to debut combo meals in the U.S. While the convenience of combo meals abounds in all fast food restaurants today, in 1958 the opportunity to purchase a main dish, side, and drink for a set price (and less than if all the items were purchased individually) was a novel idea, and one that helped them stand out in a very competitive marketplace. Other fast food restaurants followed suit, and combo meals became a staple of fast food menus and profits for decades. Pizza Hut introduced a “$5 Flavor Menu” that featured pizzas, wings, desserts, pasta, and more. Customers had to purchase at least 2 items from the menu to receive the $5 price. In 2016 Starbucks released a “Power Lunch” bundled deal for a limited time. For $8 customers were able to “mix and match” a variety of options. 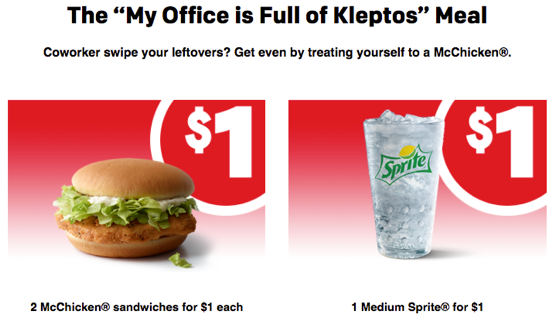 The new targeted offers drove up sales and many fast food chains reported customer visits specifically to purchase a more customized combo promotion. Interestingly, we’re seeing a similar trend in SaaS. Traditionally, SaaS companies have sold their features and products in pre-packaged “bundles,” with a one-size-fits-all mentality. While customers usually have a choice of multi-tiered packages, the features and/or products within each offer are pre-determined. Innovative SaaS companies are recognizing a shift in customer demand and offering their products and features “à la carte,” and are tailoring specific offers to target sets of customers rather than offering all customers the same generic packages. We see this not as a passing trend, but an integral part of the Relationship Economy and the future of SaaS pricing for all successful businesses. 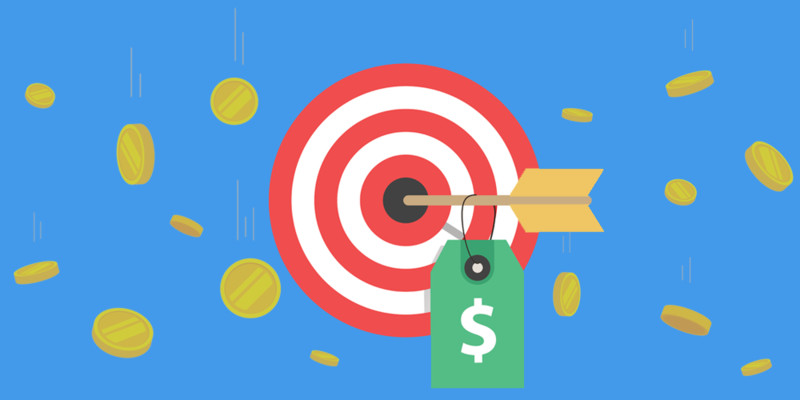 In today’s post, we’re diving into why this shift in SaaS offerings is happening and breakdown how two leading SaaS companies have shifted to providing more custom offers to niche customer segments on their pricing pages. The SaaS industry is saturated with thousands and thousands of products which are very often barely different from each other. The future belongs to hybrid products which enable customers to create their own experience tailored to their own needs. And not the ‘one size fits all’ model. SaaS is increasingly becoming a more saturated space. SaaS businesses are using a variety of methods to stand out in saturated markets, and offering more customizable purchase options is a strong differentiator. Across the board, we are witnessing a consumerization of business, with consumer mindsets bleeding into the B2B approach. In our lives as consumers, we’ve become accustomed to being able to make very customized purchases of products and services. TV is a great example. Previously, our television options consisted of 2 to 3 cable company providers and a few channel package offers. 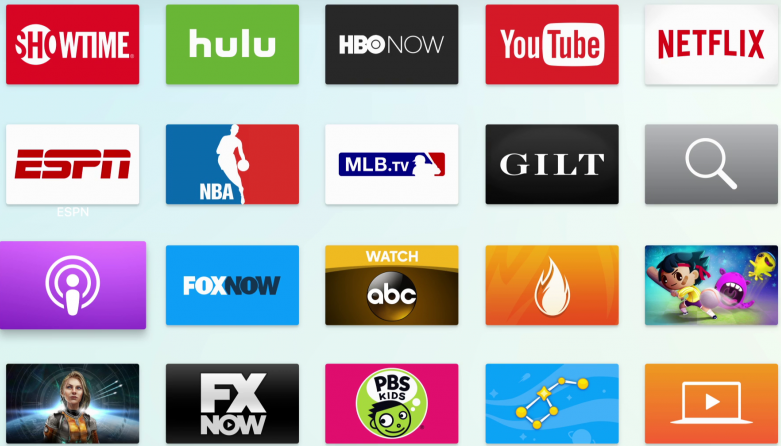 Today, in addition to traditional cable television packages there are numerous streaming services including Hulu, Netflix, and Amazon Prime to choose from. The majority of television channels are also available separately, so you also have the option of only paying for the individual channels you watch. B2B customers are consumers in their daily lives, and that B2C desire for more granular, custom purchase options is spilling over and affecting B2B purchasing behavior. Customers are also happy to have more control over the products and features they purchase from your SaaS, paying only for exactly what they’ll use. Smart B2B companies are embracing the change and providing elements of the B2C shopping experience to their B2B customers. For SaaS companies this means offering a variety of product/feature purchase options rather than the traditional way of only selling pre-defined, one-size-fits-all package tiers. In 2006 Mikkel Svane and Morten Primdahl were implementing “old-school customer service solutions” in companies. 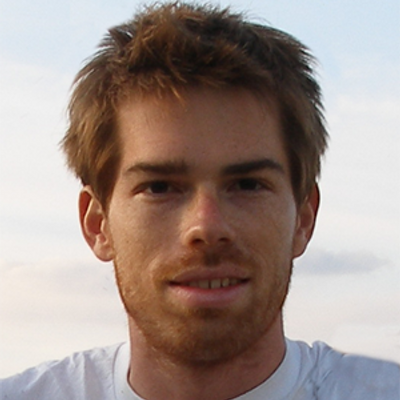 The software was hard to use and implement, and offered little in the way of user experience. The problem and room for a better solution was clear. Svane contacted Alexander Aghassipour, who also “saw the opportunity to create something beautiful in a world where design was an afterthought,” writes technology reporter Leena Rao. The three men co-founded Zendesk in Copenhagen in 2007 as “a web-based, SaaS-delivered help desk/support ticketing application that gives companies an easy way to manage incoming support requests from end customers,” reports Rao. The company launched in private beta but by 2008 had a product live for paying customers. Zendesk went public in 2014, and subsequent quarterly income statements show a continual growth. Revenue for Q4 2017 was $123.43M, compared to the previous year’s Q4 revenue of $80.62M. 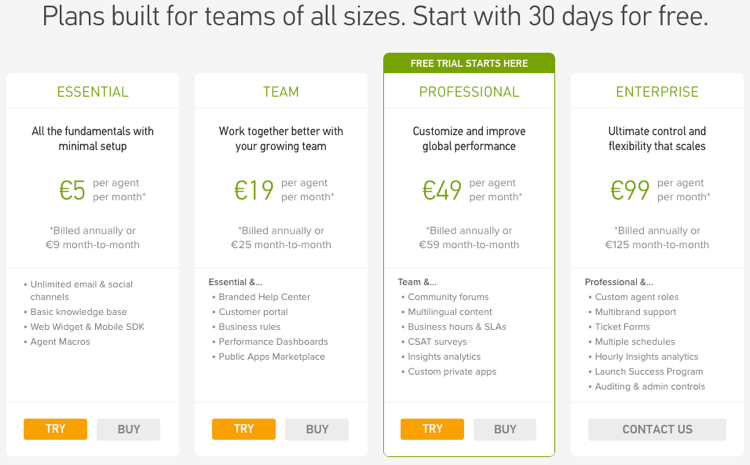 Zendesk has successfully recognized the power of providing more custom product offerings to customers rather than “one-size-fits-all” pre-determined bundles. 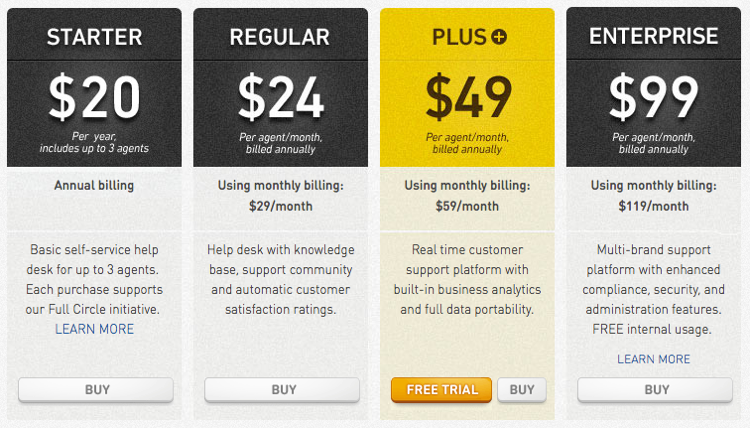 Let’s take a look at how their SaaS product offers have changed over the years. 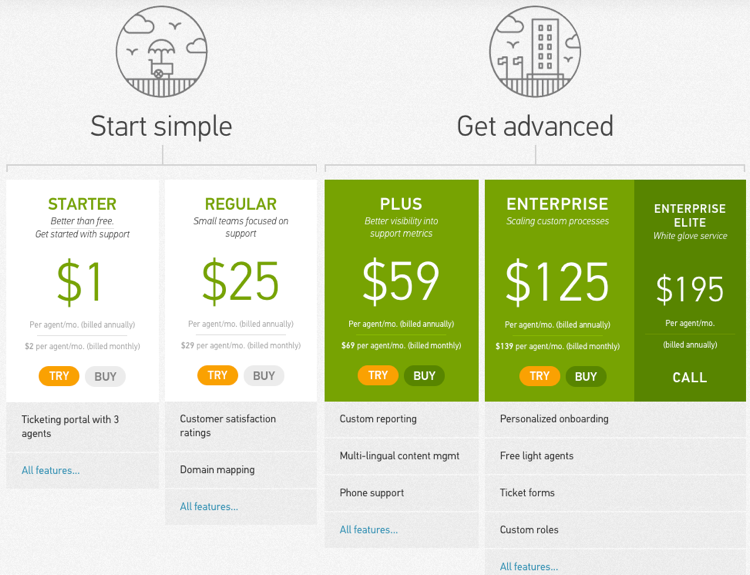 The 2008 pricing page shows 6 different pricing tiers, with the upgrade path focused on an increased number of agents and additional features such as SSL encryption. The pre-determined feature sets are differentiated by the number of agents, the available support channels for Zendesk customers, and advanced features such as reporting in the Plus+ plan. 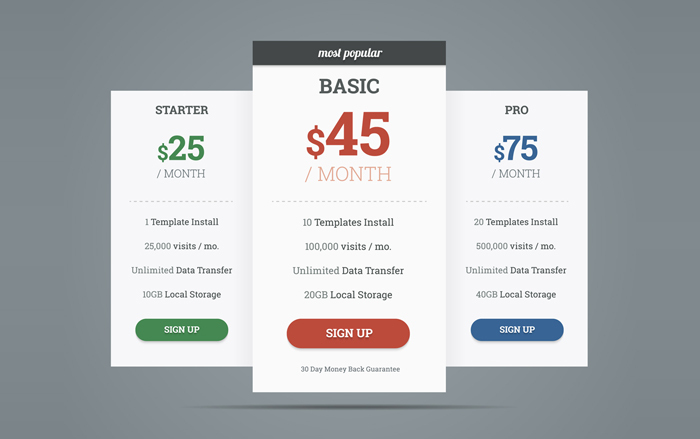 While there were some website design/pricing changes and features added, for the most part those packaged offers remained very similar until 2015. 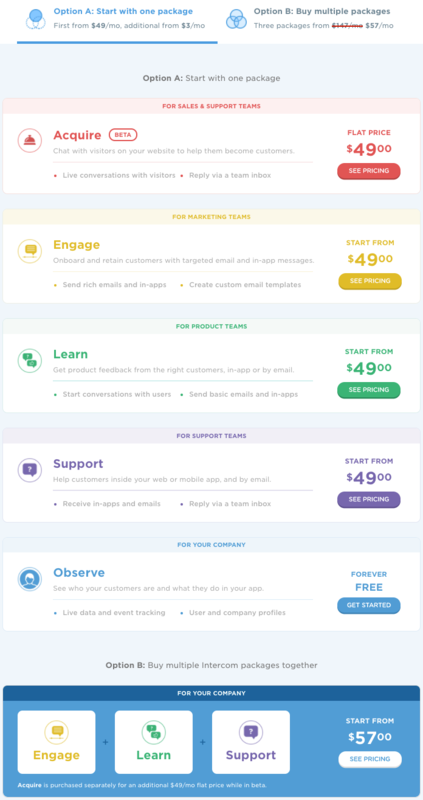 “As part of Zendesk becoming a multi-product company—with existing products like Inbox, Chat, and Voice—we’re introducing ‘add-ons’ to our new Zendesk plans that provide customers requiring advanced features with additional flexibility and value. Add-ons are specific features and products that customers can purchase in addition to their plans in order to further customize their Zendesk,” stated the company announcement. Each product had its own pricing tiers, and the number of agents remained the most common upgrade path. 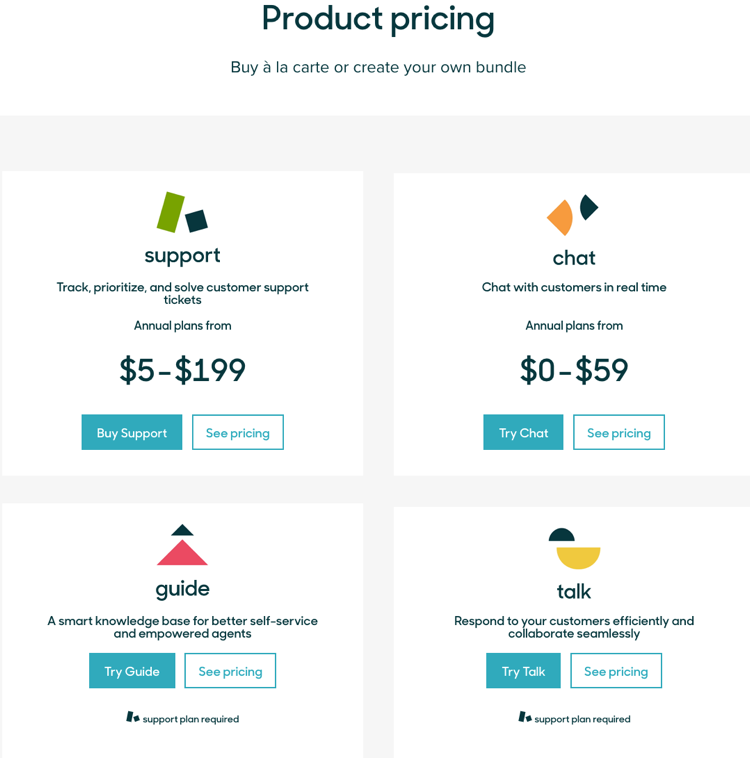 Being able to only purchase the specific Zendesk products they needed and selecting from a variety of pricing plans for each product allowed Zendesk customers to leverage more customization in their purchases than many other SaaS companies allow. Key points: Make sure the individual product options are presented clearly and allow for selection of plans within each product. Experiment to see if it’s more effective to specify the customer personas aligned with each product offering or the job each plan helps customers complete. Intercom is one of the darlings of the SaaS world, with a growth curve similar to Slack’s explosive growth. 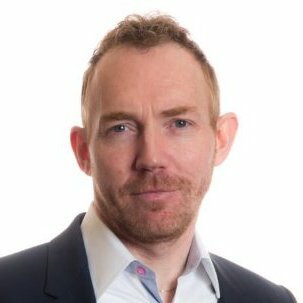 Co-founders Eoghan McCabe, Des Traynor, David Barrett and Ciaran Lee didn’t think they were coming up with a new idea, but they did think they could create a better product than the “customer-facing chat tools on websites connecting you to a faceless representative,” writes Forbes staff writer Alex Konrad. According to Konrad’s article, Jason Fried advised the fledgling company to embrace a flat fee structure. While the co-founders liked the simplicity of a flat $50 price tag for Intercom, it didn’t provide a path to build revenue. 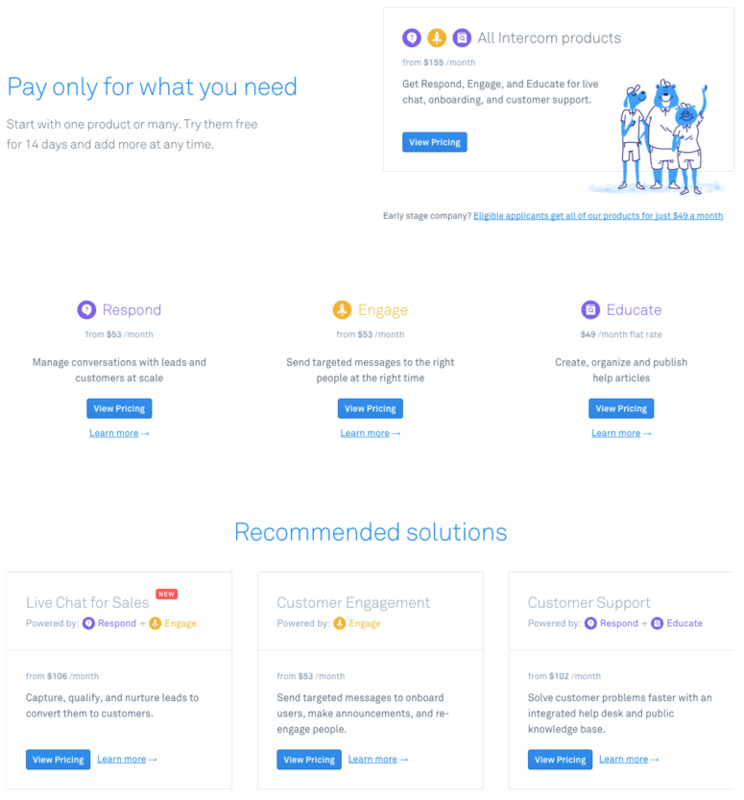 Over the years, in addition to experimenting with different product offerings to optimize monetization, Intercom has also added to their product portfolio. Ideally, Intercom will “be a one-stop shop for a broad range of interactions with outside users. Internally, Intercom has teams managing each of its products and is continuing to look for new ones to launch,” writes Konrad. They’re clearly doing something right. Intercom went from $1M to $50M ARR (Annual Recurring Revenue) in only 3 years! 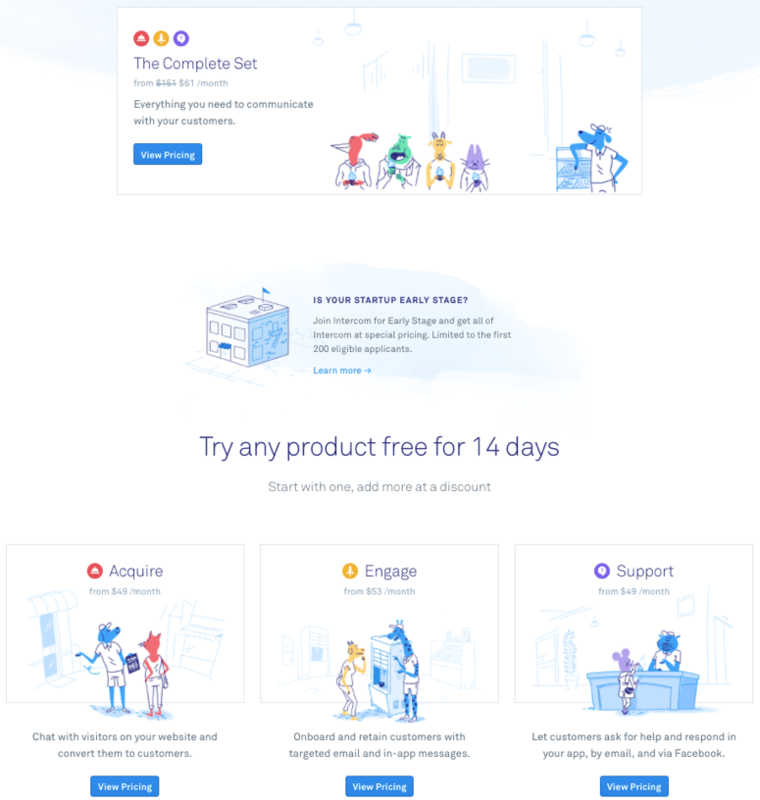 Rather than going with a “one-size-fits-all” tiered approach, Intercom recognized people purchase a product to get a “job” done and they organized each product around the “job” it accomplished for customers. The company went an extra step by suggesting the specific customer segment each product was most helpful for. An individual product could be purchased or a customer could create their own “product bundle” by purchasing the products that fit their specific company needs. It’s also interesting to see the Intercom product evolution. As they scale they continue to test and release new products, such as the Acquire product that was in public beta at the time (2015). Intercom kept the Acquire, Engage, and Support products, but dropped the Learn product offering from 2015. 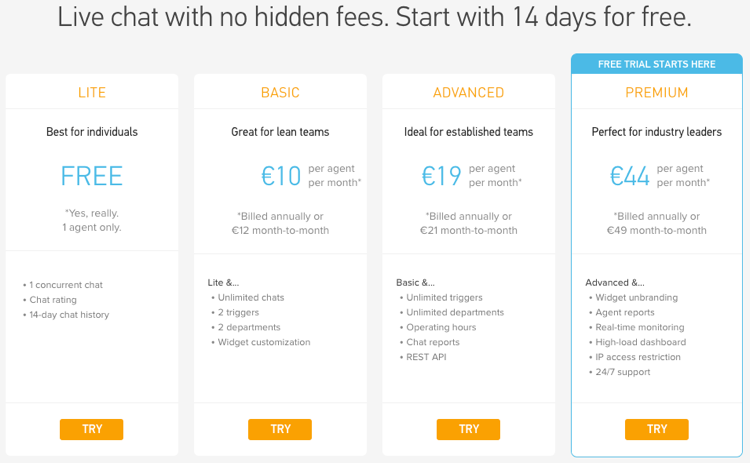 While not part of the screenshot below, the freemium plan remained available but was given much smaller exposure on the pricing page. Individual products could still be purchased “à la carte” and there were additional pricing options for separate products. The option to purchase all the products together for a discounted price was given prominence at the top of the page. 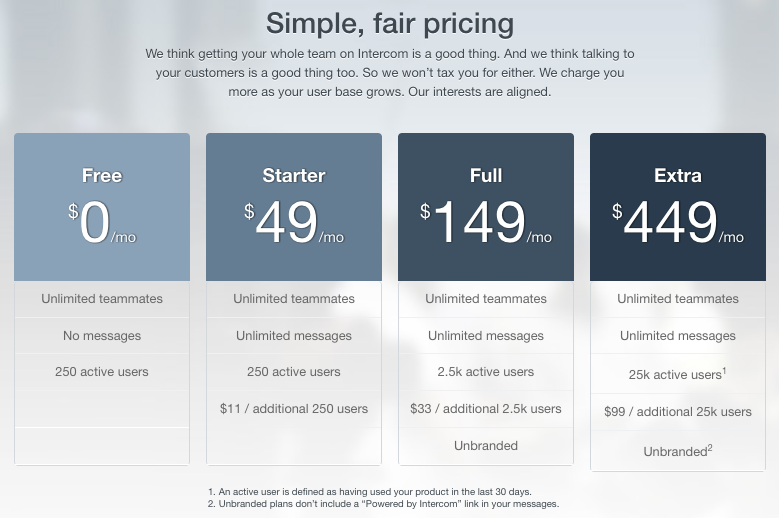 Intercom also introduced special pricing for a distinct customer segment: Early Stage businesses. Earlier critics had found Intercom’s pricing prohibitively expensive for early-stage companies. Acknowledging and singling out early-stage startups as a unique customer segment with discounted pricing was a smart move. Intercom would be part of early-stage companies’ growth and the hope is that they would remain as a customer even after outgrowing the discounted early stage pricing. When Intercom first rolled out the discount pricing for early-stage companies it was to “the first 200 eligible applicants.” Things clearly went well, because the 2017 offers included a $49 flat monthly fee for all of the Intercom products to early-stage companies who met the eligibility requirements. 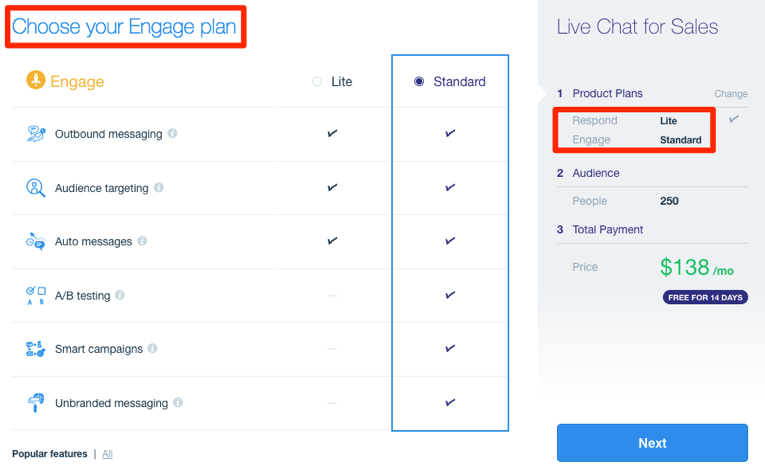 Both the Respond and Engage pricing options included “Lite” or “Standard” feature sets, along with a moving scale of active users so customers only paid for the exact usage they needed. While customers today want the ability to customize the products they’re purchasing and only pay for exactly what they need, the options to customize shouldn’t be overwhelming or confusing. Intercom shines here as well. The features of the Lite and Standard plans were clearly laid out for each product, and the customer was walked through each step to ensure they only purchased exactly what they needed. Key points: Give customers the ability to purchase products individually, but help customer segments identify with the products that are the best fit for the job the customer needs done. When a variety of product combinations are possible, make sure the purchase process remains simple. 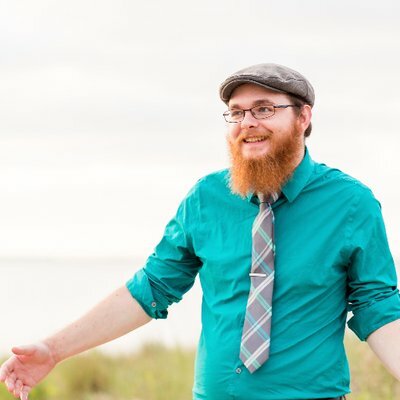 What does all this mean for your SaaS? Moving from one-size-fits-all, pre-determined packages is a bit easier when your SaaS has grown from one product to offering multiple products. However, the B2C mentality bleeding over into B2B purchasing is happening, regardless of whether your SaaS offers multiple products or not. Experiment with aligning each of your packaged offers to the Jobs-To-Be-Done framework. Your site should clearly explain to prospective customers the real “job” each product offering does for them. Identify features and integrations that can be sold as add-ons (rather than part of your pre-determined feature sets), which allows customers to only pay for those add-ons if they need them. Experiment with offers, the way you price and package your product offerings, and how you convey those offers on your website. Identify elements of your pre-bundled offers which could be customized to customer’s specific needs and usage. For instance, Intercom’s sliding scale allows customers to only pay for the exact number of people in their audience. At this point, it’s clear that all SaaS companies, regardless of size or product type, should be looking at how they can customize their offerings (packages, price, and promotions/discounts) for B2B buyers. Make sure you have an underlying billing system that allows you to easily configure, test, and manage different billing models and scenarios without all the complicated, time consuming custom code. Grandfathered pricing, new price rollouts, different add-ons available for each plan, unique discount codes… the list goes on. Being able to offer customizable plans to our customers is important, but it means a lot of complex scenarios to handle on the back end. Chargify makes it all easy and manageable, without us having to devote substantial developer resources to keep it all running smoothly.